FAR-RIGHT HAILS TED TURNER'S CONSERVATISM! 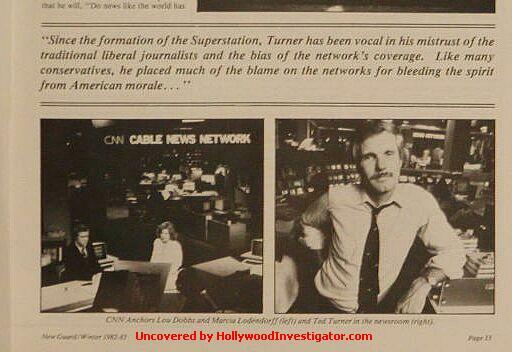 [HollywoodInvestigator.com] "Since the formation of the Superstation, Turner has been vocal in his mistrust of the traditional liberal journalists and bias of the network's coverage. Like many conservatives, he placed much of the blame on the networks for bleeding the spirit from American morale, especially during the last two decades." That startling praise appears in the pages of New Guard, a publication of Young Americans for Freedom -- a political youth group characterized as Far Right by the Far Left. 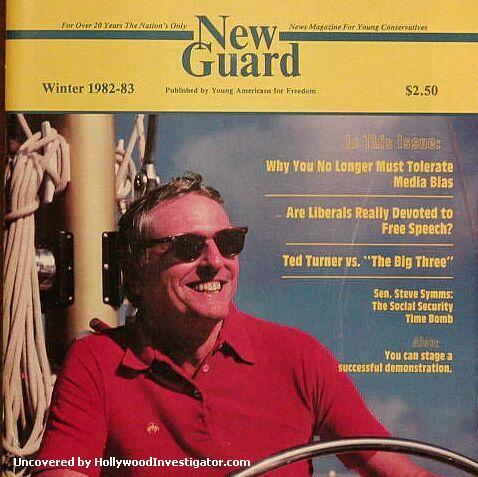 Although today's conservatives condemn CNN founder Ted Turner for his liberalism, that was not so when New Guard gushed over Turner -- in its Winter 1982-83 issue!!! According to New Guard, the article's authors "Steve Phelps and National Director Rob Schuler both attend Miami of Ohio University in Oxford, Ohio where they lead an active chapter." "He has long been an opponent of the network practice of simply showing all the bad news that they could possibly dig up. Instead of showing Boy Scouts and other examples of true American character and good works, the networks only allowed deaths, deficits and destruction to hit the air waves and invade our homes every night. 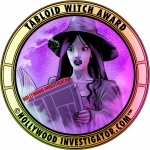 On more than one occasion, [Turner] has attacked the media coverage of the U.S. Army's efforts in the Vietnam War as being un-American and dangerous to national morale as well as jeopardizing the credibility of the media as a whole." 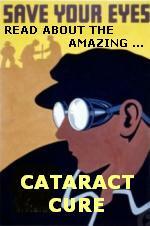 "The Ornate Cannon Caucus Room in the U.S. House of Representatives was packed with Congressmen, Senators and their aides. All were intently watching U.S. helicopters on a screen in front of the room massacring a Vietnamese village. A dashing figure steps to a podium next to this showing of a scene from Apocalypse Now, the Anti-American Vietnam War film and addresses the audience, bellowing, 'Gentlemen, I charge this film with treason!' Needless to say, Robert E. 'Ted' Turner got the attention of the audience." Phelps and Schuler's article is entitled "Ted Turner and CNN vs. The Big Three." In 1982, before the internet, before cable, before even Fox TV, the Big Three (ABC, CBS, NBC) drew over 90% of TV viewers -- in many smaller markets they were the Only Three and pulled 100% of viewers. "During his calmer moments at home with his wife, Janie, and his five children Ted does not participate in many of the social niceties. ... He spends most of the time with his family in his favorite domicile, a 5,200 acre South Carolina plantation, dominated by the white pillars and well manicured lawn reminding people of Tara in 'Gone With the Wind' (which happens to be his favorite movie -- in fact, he tried to name his daughter Scarlet, but his wife would not allow it)." "Janie" was an earlier wife, preceding Turner's marriage to "Hanoi" Jane Fonda. Amazingly, that very same Winter issue of New Guard also carries coverage of YAF protesters following Fonda's promotional tour for her aerobics tape. 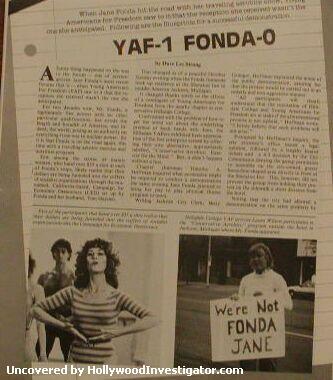 That article, "YAF-1 Fonda-0," is by Dave Les Strang.